Kilnsey is a small village situated on the B6160 just across the River Wharfe from Conistone. The village consisting of a few houses has one pub, the Tennant Arms, a trout farm and hosts one of the country’s largest one day annual agricultural shows. Kilnsey Show held on the Tuesday after the August Bank Holiday Monday first took place in 1897 in Queen Victoria’s Diamond Jubilee year. The show at Kilnsey Park is a great day out for the family offering a taste of life in the countryside from farm animals, competitions, local produce, arts and crafts and much more. The restored Old Hall in Kilnsey dating back to 1658 was a medieval administrative site for the wool trade. The Tour de France Stage 1 from Leeds to Harrogate passed through this village on the 5th July 2014. 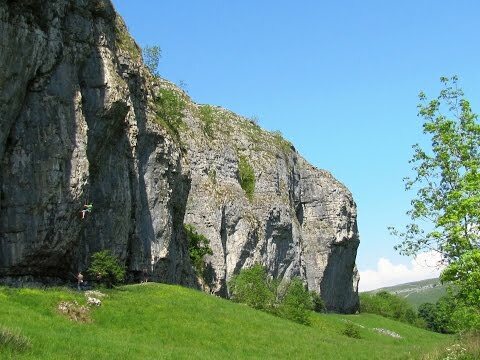 Kilnsey’s most famous feature is Kilnsey Crag a large limestone cliff of around 170 feet with a challenging overhang of 40 foot attracting many climbers all year round. The crag dominating the landscape overlooks the River Wharfe towards Conistone from the west. The historic Mastiles Lane which runs west from Kilnsey to Malham Tarn was a Roman marching road and later became an important monastic route for the medieval monks of Fountains Abbey who owned much of the land in the Dales. Mastiles Lane was used by the monks for moving their great flocks of sheep, wool and provisions. After the dissolution of the monasteries Mastiles Lane was used by Drover’s who brought their cattle to local markets it was also used by other traders and travellers as a through road to cities and towns of Yorkshire and Lancashire. The lane is now a public right of way. Green Haw Hill at 347 metres lies to the south-east of Mastiles Lane and provides wonderful views of the surrounding area. The hill being roughly the half way point on our walk it is the perfect place for a cup of tea and a sandwich. Conistone is a small pretty village in Upper Wharfedale situated beside the River Wharfe. The village 3 miles north of Grassington is set into the limestone landscape below the hillside of Conistone Moor at 496 m. Conistone with no shop or pub is home to the long established horse and pony Trekking Centre and St. Mary’s Church. The church was built in the 11th or 12th century and probably the oldest building in the district. In 1846 it was rebuilt adding the chancel under the supervision of the Lancaster architects Sharpe and Paley who maintained its original Norman style. It is built in limestone rubble with grit stone dressings and a stone slate roof and in September 1954 was granted a Grade II listed building along with two 18th century chest tombs in the churchyard. The oak pews made by Mousey Thompson of Kilburn were installed in 1957. To the east of the village is The Dib which is a narrow dry gorge created by post glacial floodwater and leads upwards from the village green through Gurling Trough to an area of spectacular limestone scenery where Mossdale Caverns lie within Mossdale Scar. From the lay-by car park at Skirfare Bridge Barn on the B6160 we head down the road towards Kilnsey passing the overhang of Kilnsey Crag until we reach the Tennant Arms. We turn right at the post box onto Mastiles Road. We follow the tarmac road past the Old Hall on the right, cross over a cattle grid and when the path splits we bear left onto the stony track, signposted Malham. We go through a gate and continue forwards until we reach a y-junction in a dip. We take the bridleway on the left through the sheep fold, signposted Malham Moor Lane and Threshfield Quarry. After passing through a gateway we bear right slightly uphill. The track becomes grassy and we bear left at the split near the water trough. We pass a limestone pavement on the left and keep heading forwards up the little valley until we come to a large flat white stone. We turn left and head uphill on the very faint path to the top of Green Haw Hill. We keep heading forwards downhill towards the trees in the distance. When we arrive at a wall we turn left keeping the wall and the trees on our right. The wall becomes a fence and we soon follow a little gully until we meet the wall in front then turn left. With the wall on our right we follow the wall downhill to go back through the sheepfolds we went through earlier. We retrace our steps along Mastiles Lane and as we go downhill and before we reach the gate across the track we go through the gate on the right. We head downhill crossing a footbridge over a little stream and pass by a ruined building. We keep heading forward following the path until we meet the main road. We turn left then almost immediate right towards Conistone. Just before the bridge we turn left at the footpath sign. We head forward with the wall on our left then at the wall corner we bear diagonally left towards the building. At the road we turn right and continue along the road back to the lay-by car park. This is an easy to moderate walk on tarmac road and tracks also grass paths and tracks with some steady inclines and declines. Elevation: approx lowest point 183m (600.4ft) approx highest point 341.50m (1120.41ft) approx ascent 197.90m (649.28ft). Approx 5.4 miles allow 2½ – 3 hours using OS Explorer Map OL2, Yorkshire Dales, Southern & Western areas. This walk is done anti-clockwise. Start point: free lay-by car park at Skirfare Bridge Barn on the B6160. Kilnsey Crag is opposite Conistone on the B6160 between Grassington and Kettlewell in Upper Wharfedale in the Yorkshire Dales. From the A1 take the A61 to Ripon. At Ripon take the B6265 through Risplith, Pateley Bridge and Grassington. At the t-junction at Threshfield turn right onto the B6160. After about 2.5 miles Conistone is on the right continue a little further beyond Kilnsey to the lay-by car park on the right just before the turn off to Arncliffe on the left. Parking: The lay-by beyond Kilnsey and also at Conistone Bridge. There are no public toilets the nearest ones are at Grassington or Kettlewell. For refreshments there is a pub the Tennant Arms at Kilnsey. There are pubs, cafes and shops at Grassington and Kettlewell.